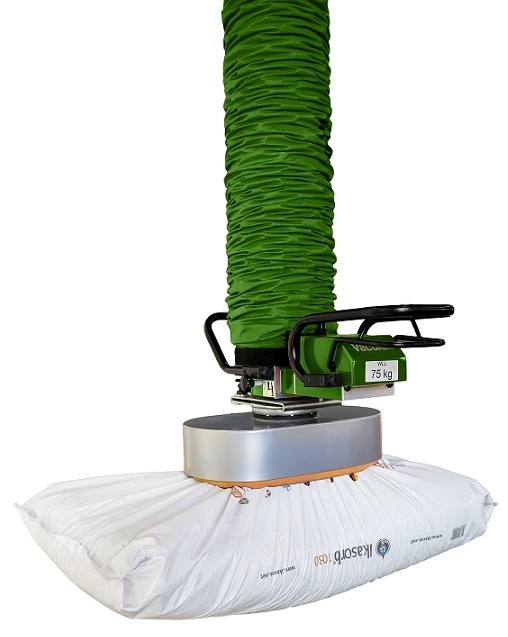 Regardless of what they are made of – paper, plastic, fabric – or what they contain – flour, sand, pharmaceutical ingredients – all sacks are handled with ease with the help of Piab's ergonomic Vaculex vacuum lifter. There is no need for heavy manual work such as lifting sacks for stacking on pallets, emptying into hoppers/feed stations, or feeding/loading/palletizing directly into or from a production line. More than one third of all workplace injuries are caused by manual handling. Yet processing staff are still often expected to lift sacks weighing 50-100 lb, risking developing musculoskeletal disorders (MSDs) such as pain and injuries to spine/back and shoulders, and repetitive strain injuries. Vaculex semi-automated lifters are designed to take the strain off workers. Enabling procedures to be carried out in space-restricted areas, the lifters offer flexible solutions where ceiling height, narrow and confined areas with limited available working space may be an issue. Low-headroom solutions and carbon fiber arms are examples of innovative answers to challenging environments. ATEX-approved models are available, as are stainless steel tools/attachments where needed. Offering ergonomic and safe working environments, the Vaculex vacuum-operated lifters also allow for efficiency improvements, elevating the productivity of a plant by enabling a good flow in handling procedures, and guaranteeing high quality of products through damage limitation. A complete range of spare parts and helpful accessories is available, such as a remote control, a noise reducing hood, and an energy-saving system for automatic pump turn-off during inactivity.